Frozen Treasure Game: Over 10 million dollars worth of diamonds and other jewelry and precious stones lay simply frozen in time up in the mountains. Archaeologists and treasure hunters have been searching for them for more 20 years, with little success. It is believes that this are the stolen items from the Royal Museum that disappeared more than 20 years ago. But, treasure-hunters have been looking in the wrong place all these years. Amanda, Melissa and Ronald are treasure hunters which successfully uncover stolen items made of gold, platinum and diamonds. They have heard about this great treasure and managed to find the location where the diamonds are buried. Today, they arrive in one abandoned hut high in the mountains. It is in a remote location, surrounded by cloud topped mountains, which makes it very hard to reach. Amanda, Melissa and Ronald have information that the stolen hidden diamonds from the Royal Museum are hidden in this place. Their goal is to find the diamonds and other valuable items. Let’s help them search the place and find this frozen treasure. 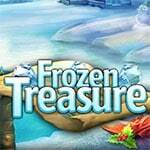 So enjoy and have fun in playing Frozen Treasure Game.